These photos really show what the room looks like when I don’t have it staged with pretty, colorful stuff. It’s a fairly small space and mostly neutral without the accessories. To take you back even farther, I dug up this old (pre-digital, pre-blogging) photo of how the room looked when we first moved in. No trim around the windows or mantel yet, and no crown molding, either. We had an old boxy TV inside a big boxy cabinet. Fast-forward to 2014 and the carpet was beat. We’ve been saving $$ to replace it for years but other house projects always took precedence. Finally, it’s this room’s turn to get some love! Usually I lighten the photos I take in this room, but here’s an unedited, unstaged shot from last weekend that shows how dark it really is — even with the lights on in the middle of a sunny day! I’ve always liked this warm color on the walls (it’s Pecan from Eddie Bauer), but after they delivered the hardwoods last week and I put a few planks of it in there I realized I was going to end up with a family room that looked like a big brown box. Brown on the walls and brown on the floors. I was afraid of how much darker it would be. Dave said, “If we’re going to repaint, we should do it now before they redo the floors so we don’t have to worry about messing them up.” He said if I picked a paint color by noon that day he’d get to work on them. I hadn’t intended to repaint, but he was right. Now was my chance to try something different after 10 years of living with Pecan. I looked through paint colors I liked in other peoples’ houses and saw Sherwin-Williams Sea Salt mentioned several times, so I decided to give it a try. It’s kind of a soft blue-green. Someone described it to be as a “sea glass” kind of color that changes in the light. It was a little more blue than I expected, and I had a moment of panic. But when my daughter Lily saw it, she squealed and said, “It makes the room look so much friendlier than it did before.” I loved that description. I want my rooms to look friendly! So I decided to go with it. I love that the floors stand out with the new paint color and warms things up. The whole room feels a lot “lighter” with the Sea Salt. Now we’ve got to put the room back together again and start figuring out how to decorate it without spending much (if any) money since we already wrote a big check for the floors. Wish me luck and stay tuned to see how it turns out! It looks lovely, Julia! The framed window is a nice touch, too. I think Lily is right – it’s like a new house! One of our projects is to get the old kitchen carpet out of the kitchen and tile it. Like you said, other projects always seem to come first. Someday. Maybe before the baby is crawling? I first want to mention that I love your blog and have been reading it for a while now. I love the new patient color in the Living Room – but can I make a suggestion? Why don’t you paint the wall over the fireplace (behind the mirror) to match the trim instead of the wall? It would make the fireplace look like a more cohesive focal. Currently I don’t think the vertical trim pieces make sense. Interesting that you mentioned that. We originally painted it white to match the trim but it just didn’t look right for some reason and bugged me so much, we painted it Pecan. Maybe we should try it again now that we have the new wall color? 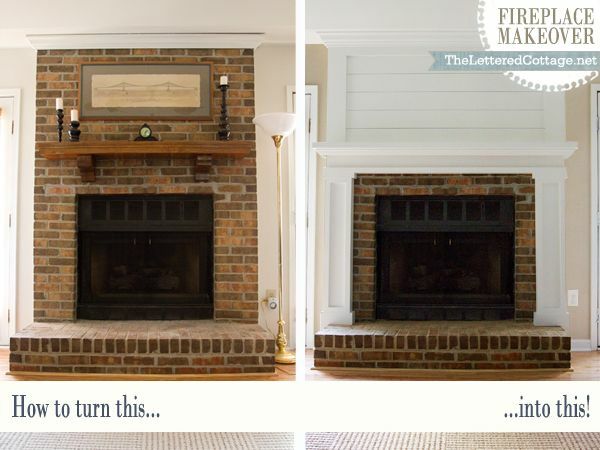 Layla @ The Lettered Cottage re-did a fireplace, using horizontal wood planks, painted white. I like the white paint idea, + the wood planks would add some texture to the room. Speaking of which, I like the way the pretty floor color complements the color of your blinds! That wall color is so beautiful, too! Love that. Thanks for the link, Aida! Maybe is needs a little more detail (molding) to make sense? 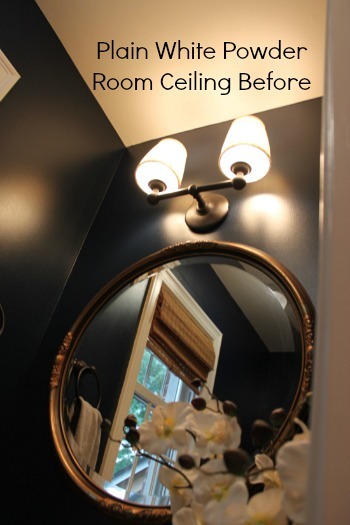 What a difference a coat of paint can make to a space!! I love the sea-glass shade you’ve chosen. Watery blues are my favourite and I have a similar shade in my master and ensuite as well as in my kitchen. Your new floors are gorgeous. Last spring, we ripped out 10 year old carpet in 3 of our rooms and replaced with hardwood. So easy to clean and I wish we had done it years ago but it wasn’t in the budget. I can’t wait to see what you post next!! He is. He’s so handy at things like that…and I’m so NOT. He’s trimmed out most windows in our house at this point and installed crown molding throughout. It’s amazing what a difference things like that make. I could use him at my place…would love some wainscoting & larger skirting boards in my house! other pictures of your home. Beautiful ! out for the seasons too. Love your site ! Love it! The new wall color. The floor. Everything is so pretty and fresh … and friendly! 🙂 I look forward to seeing it all decorated. Thanks for sharing! Yes, it definitely looks like a new house (room)! it looks like it has a more coastal vibe now (if that makes any sense. )I actually have a similar color on my walls as you did before (“Ponytail” from Sherwin Williams) with hardwoods and still really like it, but I lean more toward earth tones. Great re-do Julia! The new color does feel kind of beachy! I still like the Pecan and have it in other rooms that get more light than this one does, like my dining room. I also think the fireplace wall looks fine just the way it is. The white paint is a great idea, however, the vertical moulding just centralizes the fireplace even without the support of the white paint. You are probably right about the mirror as well, seeing it is a dark colour. Don’t stress (if you are), I, and many other readers, love the wall how it is. I love SW’s Sea Salt! I have it in my guest room with very coastal accents and my downstairs powder room. I saw it several years ago in a Showhouse here in Atlanta and fell in love with it! I knew the minute I saw it I had to put it somewhere in my house. I love how it changes hues depending on the light and accessories. Now you’ve got me thinking I need a friendlier Family Room! It’s amazing how it changes color throughout the day. It totally looked green in the can, and then that night it dried blue on the wall. Sometimes it looks more gray. It’s always pretty, though. Thanks, Brenda! I agree I love the new wall color. It makes it look like a whole new room, fresh and bright. We have sea salt in our kitchen and family room! Love the color. Your room looks great! I’m thinking of taking it into our kitchen now, too. I loved it in yours, Alyson! SW’s Sea Salt must be THE new ‘hot’ color as I saw it everywhere (starting this past summer) in the decorating magazines. It must be one of the most popular wall colors for common room spaces with the exception of the grays (which are becoming sooo passe`.) It looks very nice in your living room. Hope you enjoy it. It’s so beautiful already–light, airy and even more inviting! I love the transformative power of paint. Good call on the wall color change. It really sets off the floor color. I love your couch and chairs. Looks great so far! I love your “new” living room! It looks great. Sea Salt is a beautiful color – we painted our kitchen that color last year and I still love it so much. Love the changes in your family room! Sea Salt was a beautiful choice! We are going to be putting hardwood flooring in a yet unfinished addition to our home, and I wondered if you would share the color and maunufacturer of the flooring you chose? We have been looking at maple cinnamon by Bruce thru Home Depot. Yours appears similar in color in these photos. Thanks for sharing! I forgot to mention that we were matching the floors that were already in the kitchen and foyer, which were Bruce Gunstock: https://www.homedepot.com/p/Bruce-Gunstock-Oak-3-4-in-Thick-x-2-1-4-in-Wide-x-Random-Length-Solid-Hardwood-Flooring-20-sq-ft-case-CB924/100118026#.UtAoJLTVJmI. Thanks, Sue! While the new floors are pretty, the new paint color takes the cake. World of difference! Beautiful, Julia. Light and, indeed, friendly. You guys always do lovely work. The new paint color is perfect, Julia! It looks so fresh and pretty with your new floors. Love the wall color Julia…and the floors!! Such a pretty room! Yes, there is something about the fireplace…but I think it’s the color of the tile (?) surround. It looks like a pinky beige which is throwing everything off. Just a thought:)) Your email is one of the few that I open every time…love your blog!! The tile is kind of a sandy-tan color in real life. I’m not seeing any pink so it must be something about the photo. It would be fun to get some cool new tile down the road, though. The firescreen covers a good bit of it now that it’s back in the room (or “fire cage” as my daughter calls it!). Hopefully it will look better when I have all the decorations and artwork, etc., in there. Thanks, Roberta! It’s just beautiful and I love, love, love the newly trimmed out window! Julia, it really does look like a new house! I LOVE the wall color and those floors are gorgeous! What a great way to start the new year! If I may also make a suggestion, it would add to the overall look of the fireplace if you could have bookcases or shelves on either side of the fireplace under the windows. The new color and the floors are great. Looks SO much lighter and brighter! We recently painted our living room Sea Salt as well and I had the same panic moment! After we got the first coat of paint on the wall, my husband referred to the color as “nursery boy blue” and I nearly died. Six months in and I’m starting to really love it, but it’s taken some time to get over those initial comments. 🙂 Your pictures remind me of why I loved the color so much in the first place. The room looks beautiful! It’s funny how a comment like that sticks with you. Reminds me of when we painted our mudroom green and when my son saw it he said, “I love it. It looks like Shrek!” Womp-womp. A week later we repainted. Ha. Love the wall color choice! Hardwood is always such a game changer. Looks so much more open! Wow, looks fabulous!! The room is totally transformed. I look forward to seeing your finishing touches. You have a lovely home, so warm and inviting. I also really enjoy your blog. I love it so far! Sea Salt is one of my favorite colors ever and it plays so well with the hardwoods. I agree with the fireplace suggestions–wonder if there is a way to use found materials to do it (thus saving the pocketbook)? Random thought–would this https://bit.ly/19XySu3 from KariAnn at Thistlewood Farms be adaptable for over the fireplace? Done similarly to the fireplace makeover from The Lettered Cottage, but more dimensional and maybe a way to bring in a bit more subtle color? I love anything KariAnne does and those shutters are way coo. Thanks, Brandy! I like the Sea Salt with the toile chairs especially. It is very fresh and lovely. Your fireplace is FINE. It’s easy to spend other people’s money isn’t it? PS: are greys really passé already? PS, I really like the silver lamp with that combination. If it were me, I would be pulling out a lot more of the silver! The silver does look good with it! julia, it just looks great, totally different room. i always think if you are going to sink a lot of money into a re-do, hardwood floors are the way to go. they totally change the look & feel of the room as well as being incredibly functional. the paint color is perfect, somehow it is warm as welll as cool–i know, that makes no sense :). suggestions (since you asked:)): to define the conversation area, a large, hanging ceiling lantern centered in the room; a neutral rug, seagrass or a muted pattern also centered in the room; the two chairs across from the sofa; i love what another reader suggested, bookshelves on either side of the fireplace or even, just two really thick shelves with accordingly thick brackets–big, woven storage baskets underneath; or matching wine/cocktail cabinets on either side of the fireplace. of course, none of this is free and the room really does look just lovely as is. i love homes that evolve over time rather than are decorated all at once. Great ideas. I’d love to have some kind of light fixture from the ceiling. Thanks, Nanne! Lovely change with the new wall colour and wood floors! If you know who Sarah Richardson is (and you probably do), she would be impressed! Lovely–so fresh and bright. The sea glass shade also brings the room a calming feel. And I love the new floor! What a fresh and lovely update! Your floors are gorgeous and that wall color instantly makes the space feel new. Great choice! I love the silver and orange accents from your mantle “line up”. The punch of warm orange against the cooler seaglass walls and silver lamp, along with the graphic contrast of the toile on the chairs, is such a great combo. Putting more blues in the room via accents might start a blues competition in the room and not let the more complex green/blue shade on the walls really shine. For me the orange gives it the right warm tone to bounce off of. Your taste is exquisite – I’ve had a crush on your sunroom for a long time 🙂 – so anything you do will be amazing! I would never have chosen a paint with a blue cast to it because I tend to feel that all blues read as cool, but this was absolutely the right choice for this room! It is gorgeous. New floors are the best! Especially a hard surface floor instead of carpet! Nicely done!!! That was my fear exactly, Claudia. I had a pale blue study once and it always felt chilly. This one feels a lot warmer for some reason. When I chose it I thought it would be more green than it is, but I like it anyway! Nicely done! The blue really lightens up the room and it looks great with the hardwood flooring. Beautiful choice on the wall colors and the hardwood will be a boon for the rest of that room’s life, whatever color the walls are from year to year. Trim on the walls is key, isn’t it? I love what you’ve done everywhere with trim. I think the fireplace wall looks great as is (I’d put some silver or mirrored glass items on that mantel), I also think it would look good if that section directly above the fireplace wall was painted to match the trim (the wall would have more depth and look more sophisticated, if that’s what you want in your FR), and…I wondered what happens if you painted the section above the mantle a color similar to the tiles. I just wondered about that. Have fun with it, Julia, and thanks for sharing. Interesting ideas, Wendy — thanks! It’s beautiful. It does look friendly! I hope that clock is making a comeback. It’s fabulous. I hung it back up and it stands out more now with the Sea Salt on the walls. Love the contrast. It turned out great! Love the wall colour. Reminds me of the colours that Sarah Richardson would use. I would love to see cabinets/ shelving either side of the fireplace as suggested by other readers. I would, too, if there’s space for them. It’s pretty tight back there since the room is so small. I still love your black and white chairs with the new blue. You could use them and more black here and there, in pillows and such and then pick another color to dribble here and there, like yellow. Love the color!! The black in the room will complement it so well!! Great update! We painted our guest room Sea Salt and I had the same moment of panic, mostly because I thought the color read too juvenile (especially with the quilt I had on the bed). After a while the color grew on me…I feel like it aged into a different color – one that was more sophisticated. It’s now my favorite color in the house, and going into that room makes me feel both calm and happy. I think it will go very well with textural neutrals and organic accents (shells, pebbles, sisal/jute rugs, rope, twigs/branches, glazed pottery, etc.) Enjoy your “new” house! It is a lovely color and the floors are absolutely gorgeous! You will have so much fun decorating. I look forward to see how it turns out!! That would be lovely! I think I’m going to be able to try different things for different seasons with this backdrop. Don’t friendly rooms make you smile with joy?! Have fun with your brand-new, friendly space! Julia- I love how the new wall color makes your furniture pop. Great color choice! Both the new floor and new paint color look great. The sea salt color seems more calming or restful than the previous color. It will be interesting to if or what sort of area rug you choose. Oops. It will be interesting to see if or what sort of area rug you choose. I shouldn’t comment after midnight. I guess I can’t proofread late night. I painted by kitchen and dining area sea salt a few years ago. I’ve been thinking of using the next darker color for my living room or maybe just sea salt again because I like it so much. Your living rom is lovely. Absolutely beautiful. I’m considering painting our kitchen a similar colour – had been worried it might be a little ‘cold’ but perhaps I am worriting over nothing!! Hi; I am so happy I stumbled onto your blog from the blog betweennapsontheporch.net. Your home is wonderful and I LOVE your design style. The family room looks like a great place to spend a lot of time. TFS. 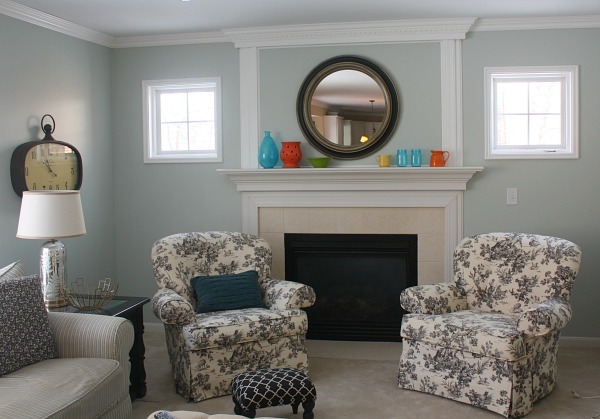 You picked one of the prettiest colors ever to paint your family room. We painted our master bath in “Sea Salt” and I just love it. The size and lighting of the room really determine whether it will be more of a greenish or blue tone. Recently, on a home tour I saw a bedroom painted in SW “Ice Cube” that was also gorgeous. BTW… your family room looks great and the new hardwood floors are beautiful. I think a sisal rug would look really nice in there for spring and summer. What a difference hardwood floors and paint make – it’s warm and inviting. I LOVE a seagrass rug and it would be beautiful with the color of your walls!! I like the idea of shelving on either side of the fireplace, but I think something free standing, and with a bit of shabbiness, might be nice. Susan, at the blog Between Naps on the Porch, discusses her great bookshelves find here. I realize your windows would make it impossible for pieces of this scale, but you get the idea. Ooh, love her shelves! Wish I had space for some like that. Now that everything’s back in the room, I’m not sure how we’d fit anything behind the chairs. Unless we found some very shallow ones? It’s too bad the fireplace doesn’t stick out a little bit so we could create some built-ins. That would be fun. Thanks, Alie! LOVE IT. Isn’t it wonderful how the wood “warms up” the room!?! I love hard-wood floors. I also love the new paint color. That’s a great choice. Especially once you start moving back in the layers of color. LOVE the new lighter SW paint color. Our LR is a very similar color and we love it. One would think a pale color with our often cloudy winter days would be awful. But we’ve found it to be rather soothing and not nearly as dreary as one would think. I also love your ideas for accent colors. I’m working on the same thing in our LR now that the Christmas decor is gone. Sorta wanting to go all neutral, but also thinking a little color might be fun. We’ll see. BTW, love your B & W toile chairs! I can see this color working really well in a bedroom. Thanks, Rebekah! Your transformation is beautiful! We had a golden yellow as well and switched to Sea Salt last year. The goal was to make the house feel like “vacation” and everyone who has seen the new color echos the sentiment. You will definitely notice the color appears blue or sea foam green depending on the lighting and time of day. Enjoy! Funny you said that because when one of my friends saw it the other day she commented that the color reminded her of something you’d find in a beach resort on vacation. Love that. Thanks, Julie! Love it! Love, love, love the paint color. Adore the molding. It’s just lovely. Can’t wait to see how you change it up going forward. Love the new color and floors. Although, after 6 months of renting an apartment with dark “hardwood”, I’m seriously reconsidering whether I like wood floors. I love the look of them, but I feel like you can see every speck of dust or flaw that you wouldn’t notice with carpet-particularly with the dark wood. If I ever get wood floors, they’ll be blonde. That is definitely the case with really dark floors. These aren’t that dark, though. They’re more of a medium tone. I’ve had them in my foyer, dining room, and kitchen for 10 years and they’ve been pretty low-maintenance because of the variation of color in the planks. I think it helps if you don’t have floors that are a solid color, so scratches, flaws, and dust blend in a little more. I used SW sea salt this past year in a remodel of our bedroom and addition of a master bathroom. I LOVE it. In the bedroom we used it floor to ceiling on bead board. In the bathroom we used in on the top half of the walls with white bead board on the bottom. The master closet stayed white. Every night when I go to bed and every morning when I wake up I am still amazed at how beautiful it turned out in our 101 year old farm house. Wow Julia! Love the Sea Salt and wood floors always make the room! I love the lighter toned neutrals for walls.